By D Magazine | 9 years ago We asked some of the city’s most esteemed interior designers to give us the skinny on everything from their best-loved antique stores and hotels to their chair and paint of choice. Here are the tasteful results. By Mary Candace Evans | 9 years ago Forget sibling rivalry. Kari Schlegel and brother Kirby Schlegel enjoy separate—but equally fabulous—views from atop the W Dallas Victory. By Peggy Levinson | 9 years ago There’s no such thing as a lost art. Sometimes it just takes a little while to find it. We hit the pavement to uncover Dallas four artists who prefer to do things old-school. By D Magazine | 9 years ago Fun finds in shades of white add drama through shape and form. By Peter Simek | 9 years ago Our first home didn’t need any major repairs or renovations. But add a parental visit and a new job, and things got hairy. By Kellyn Curtis | 9 years ago This quirky Dallas gift shop on Henderson Avenue is like a toy store for grown-ups. 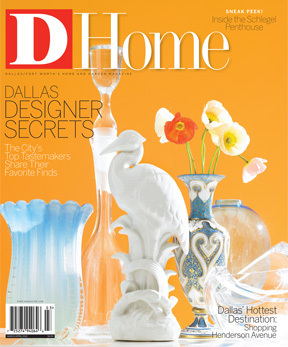 By D Magazine | 9 years ago What’s happening on the Dallas arts scene in spring 2010. By Christine Allison | 9 years ago Dallas homebuilders, mind your manors. A little courtesy would go a long way with neighbors who live with new construction. By Mary Candace Evans | 9 years ago From the beginning, Russwood Acres was intended to be understated but high-end. Plus, the location—in the heart of Preston Hollow—is hard to beat. By Kellyn Curtis | 9 years ago Snag one-of-a-kind finds at Form, Dallas’ newest midcentury modern mecca. By Kellyn Curtis | 9 years ago William “Ty” Burks and Christopher Ridolfi open their dream shop, selling items such as furniture and gifts with a handmade, artistic quality. By D Magazine | 9 years ago These modern spins on classic pieces take the parlor from dull to divine. By D Magazine | 9 years ago Add a little magic to the room with an antique ceremonial headdress from Cameroon.